Figure 8.1 Driving home the last spike of the CPR, 7 November 1885. This 1885 photograph (Figure 8.1) of a bearded gentleman in a top hat driving home the last spike of the Canadian Pacific Railway — completing the “National Dream” — ranks among the best-known photographs in Canada. 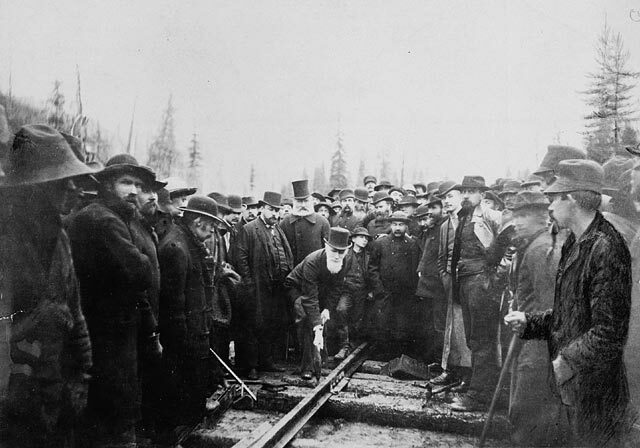 Unlike the men crowded around, the man wielding the sledge hammer — Donald Alexander Smith, vice-president of the Bank of Montreal — had no part in actually building the railway, but helped to finance it, which is why this photograph is historically significant. It celebrates the first time a major piece of national infrastructure was financed in Canada. More than driving home a spike, Smith is laying the cornerstone for the country’s capital market. Capital markets are relatively recent creations — most capital markets have been created during and after the late 19th century. They may be recent, but they are important because controlling the country’s savings is an essential characteristic for any advanced capitalist economy. We call it capitalism for a reason. Capital markets generally have four functions and, in North America and Western Europe, each function historically has been carried out by different types of companies: brokerage houses, banks, life insurance firms, and trust companies. The mere presence of such companies does not, however, mean that a capital market exists. A functioning capital market requires a stock market where brokerage houses buy and sell stocks and bonds, lending facilities for both the medium and the longer-term functions generally offered by banks and life insurance companies respectively, and a disinterested institution that can be trusted to distribute dividends and interest payments. In Canada and elsewhere, such trust companies also manage the estates of wealthy families. These differing types of financial intermediaries only develop when a capitalist economy reaches a certain level of maturity. Take, for example, life insurance, which if you stop to think about it, is rather an odd idea. It is not life insurance, but death insurance; since we are all going to die, how can a firm profitably sell insurance against something that inevitably will happen? Well, the short answer is reliable statistics on life expectancy, called actuarial tables, which allow the firm to reasonably assess the risk of issuing a policy to a particular person. The statistical basis for such realistic evaluations of risk did not exist until governments started capturing demographic data through censuses, which was not achieved in Canada until the mid-19th century. Who would want to or need to pay the high costs of an insurance policy? If a family owned its farm or business, the death of the male head of household would likely be an emotional, but not necessarily a financial, loss, as the productive assets would remain with the family. If, however, a family’s income and social position was dependent on the salary earned by the male head of household as a professional or a manager, his death could spell financial ruin. Significant numbers of salaried men only emerged in Canada in the last quarter of the 19th century, in the wake of the industrial revolution. This salaried and gendered middle class would remain the main focus of life insurance companies in Canada until the standard of living for working class families began to improve with unionization after World War II. Insurance companies sell policies to young people and hope to benefit from decades of premium income before they have to pay the death benefits. This means life insurance companies have an income stream that they can invest for the long term. Banks, on the other hand, once they start to develop their deposit-taking business, have more pressing concerns. After all, their clients are saving for something they hope to purchase long before they die, so banks tend to specialize in short- and medium-term loans. For most of the 19th century, banks in Canada were not particularly interested in deposits, and not at all interested in consumer loans. Instead they financed merchants’ inventories and facilitated the international payments required by imports and exports. The wages paid to most workers during the industrial revolution were not sufficient to allow for much in the way of savings. The shift happened gradually, and by the outbreak of the Great War, savings deposits accounted for half of all bank liabilities. This, of course, required a completely different type of banking system. At the time of Confederation, there was one bank branch for every 28,900 Canadians; by 1920, there was a bank branch for every 1,900 people. The savings of both working-class and middle-class families were being mobilized to finance Canadian industry. Most firms in the 19th century financed their operations through retained earnings (that is, the profits they hold on to). Utilities, railways, and financial intermediaries accounted for the overwhelming majority of shares available for purchase on the embryonic stock markets of Montreal and Toronto. In 1880 (the year construction started on what would be the CPR), $11.5 million dollars in new shares were issued in Canada; by 1900, that figure had risen ninefold to $101 million; by 1910, it had ballooned to $712 million. Brokerage firms engineered these new stock issues. These brokerage firms bought out regional industrial producers and merged them into pan-Canadian corporate entities that were large enough to set prices in their respective industries. Exceptionally large fortunes were made in these stock floatations, and the most successful brokers, such as Max Aitken (aka: Lord Beaverbrook) of Royal Securities, were among the wealthiest financiers in the British Empire. The changes wrought by corporate concentration profoundly affected the banking system and shaped the developing national capital market. In 1900, only a handful of businessmen — and they were all men — sat simultaneously on the boards of four or more leading companies. By 1930, a fifth of all directorships in the country’s leading firms were occupied by men — and they were still all men — who sat on five or more boards. 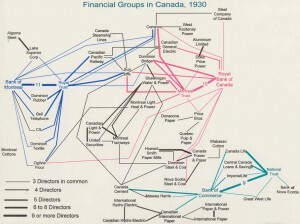 The networks that tied these men and their firms to one of three financial groups, each centred on a chartered bank, are clearly visible on the graph in Figure 8.2. 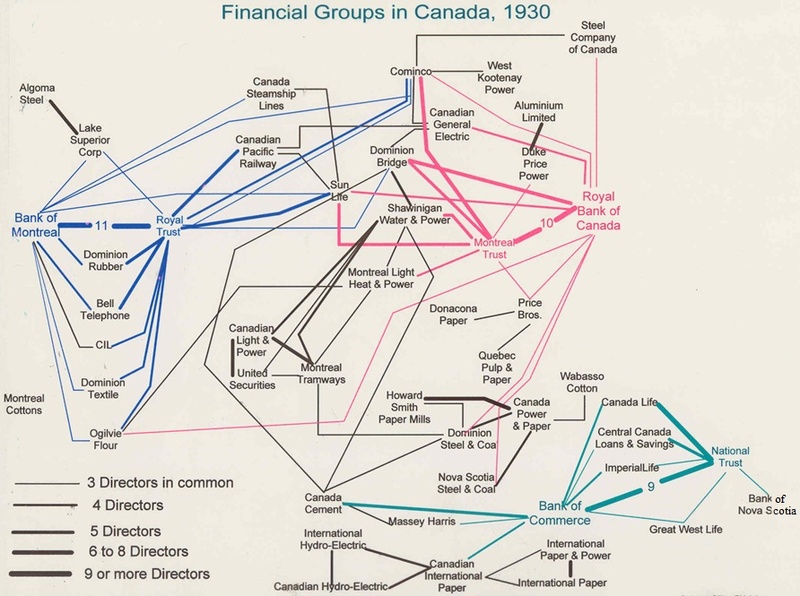 Figure 8.2 Directorships in common among the leading firms in Canada, 1930. Research by Gilles Piédalue, graphic by Robert C.H. Sweeny. Michael Bliss, the leading conservative historian of Canadian capitalism, has characterized the emergence of a group of companies linked to the Bank of Commerce as being “All in the family,” and there is an element of truth to this. But unlike the situation in the United States, where families such as the Rockefellers, Morgans, and Mellons effectively owned their own banks, none of the leading Canadian chartered banks were controlled by a single family. Rather, families who controlled important industrials sat on the boards of the financial intermediaries that financed their firm’s expansion. This familial control continued to characterize the English-Canadian capital market until at least the 1970s, when no fewer than 88 men and 2 women sitting on the boards of leading financial intermediaries had inherited their position from another family member. The close connection between industry and finance did not characterize all the chartered banks. Smaller regionally-controlled pools of banking capital represented by the Imperial, Toronto, Dominion, and Nova Scotia banks continued to be active in both national and international money and commodity markets. In Quebec, a slightly different situation arose. In the heartland of the St. Lawrence River valley an integrated market linking small insurance, trust, and banking operations emerged, but in the out-lying regions financial services consisted primarily of mutuals, co-operatives, and credit-unions. It was only with the Quiet Revolution of the 1960s, and the greatly enhanced economic role of the provincial government that one could reasonably speak of a single and distinct national capital market serving French Canada. This achievement did, however, build on the success of firms largely created in the early 20th century, a period when — in terms of political and educational rights — French Canada was in retreat. Building a trans-continental railroad has long been understood as central to Sir John A. Macdonald’s National Policy. The resettlement of the Prairies and the resulting wheat boom were key to historians’ understanding of economic growth in Canada until the collapse of the wheat economy in 1928. The lesser known creation of a two-tiered capital market in English Canada and the simultaneous laying of the foundations of a separate capital market in French Canada was, however, arguably the most enduring economic legacy of Macdonald’s policy. The remarkable longevity and solidity of the Canadian financial system formed in those years continues to shape the contours of our economic life. Financial institutions appeared in Canada in greater numbers and variety in the late 19th century. Their existence was a measure of the growing complexity of the local capitalist economy and the rise of managerial middle class. Banks, life insurance companies, trust companies, and brokerage houses took invested money and made it available for loans. One result was a consolidation of smaller Canadian firms into larger ones. This also led to interlocking directorships centred on a chartered bank. The financial systems that arose in the late 19th century continue to be influential in the 21st century. Hon. Donald A. Smith driving the last spike to complete the Canadian Pacific Railway. (Online MIKAN no. 3194527) by Alexander Ross / Library and Archives Canada / C-003693 is in the public domain. Sweeny Directorships by Robert C.H. Sweeny is used under a CC-BY license. 8.3 Capital Markets by Robert Sweeny, Dept. of History, Memorial University of Newfoundland is licensed under a Creative Commons Attribution 4.0 International License, except where otherwise noted.